SRINAGAR, India, Feb 22 2016 (IPS) - Maryam Yousuf, 50, gently washes her hands under a common tap outside her house in Saida Kadal, a grassy middle-class locale encircled by the famous Dal Lake in Srinagar, Kashmir’s capital. She puts on a Pheran, the traditional long loose gown, and holding a large steel bucket walks towards a dimly-lit cowshed, made up of wooden shingles, in a corner of her home backyard. Nearby, children are playing cricket, flaunting wooden sticks as bats, and a flock of chicken cluck and nibble at left-over vegetables. As the milk squirts into the bucket, Maryam says she can’t forget the day when her husband sold all the three cows after she had fallen ill. As a mark of protest, she didn’t eat food for three days. “My cows are very dear to me. They are like my children and when he sold them, I told him to give me back my identity”, she said. Her husband not only brought back the cows, he even purchased another one for her. 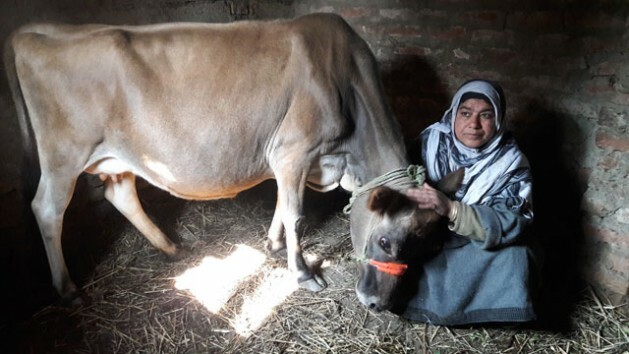 “It was not less than Eid (an Islamic festival) for me,” added Maryam who has trodden the path of entrepreneurship as a dairy farmer for the last 30 years. In this conflict-ridden Himalayan territory, entrepreneurship has witnessed many a metamorphosis. Initially, it was taken up by the educated upper class men who invested their own money to build their fortunes. Then educated women followed and few have made a significant mark over the years. However, what has not been recognised is that many uneducated women are also enthusiastically raising family incomes through micro ventures and reinvesting their earnings in their families and communities. These women also inspire other women in their localities to pursue their dreams through entrepreneurship at the grassroots level. We are managers by default. If we can run a house without doing any course, we can run a business too. In her community, Maryam is considered an inspirational woman who is making money in dairy farming. She believes that no one can stop a woman other than her own self: “We are managers by default. If we can run a house without doing any course, we can run a business too.” Her journey of entrepreneurship started when her husband fell ill due to strenuous work in carpet weaving. She had to look after six children – five sons and a daughter. She sold off her belongings and started her venture with Rs 2,000 rupees ($ 29). When she first started, Maryam possessed less than one kanal (0.125 acres) of land. Today, she owns three kanals (0.375 acres). Each cow produces 10-18 litres of milk per day and she sells it at a fair price. She also makes cheese, curd, sweets and takes orders on special occasions. Maryam not only generates revenue for her family, she also offers small loans to other women in her community and encourages them to work. She is known by the name of ‘milk woman’. “My children help me to manage the accounts. They respect my struggle in life and owe their achievements to it,” she says. Maryam earns Rs 8,000 rupees ($117) each month from each cow. From her three cows, she is able to look after her daily needs and add to her savings. She believes that rearing cows is her asset as she is managing everything from her home-based business. “The thing of satisfaction is that I don’t have to depend on my children. I recently married off my elder son without anyone’s help”, she proudly stated. Begum resisted family pressure for her decision not to re-marry. “In a close-knit society like ours, independence is often synonymous with opposing moral and cultural values. I had already waged a war against my family,” she said, adding that “I was left with no option other than to struggle alone and push myself hard.” Her memories are fresh with the past struggles when they had nothing to eat for days. But that didn’t deter her and she kept going until she sowed the seeds of her fortune. “I feel so contented not to beg before anyone. People don’t pity me,” Begum says. 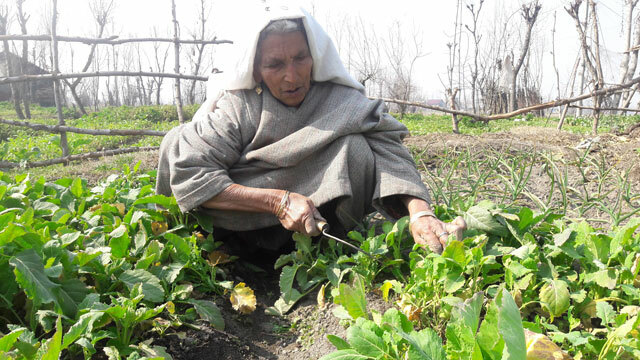 “I provide them fresh and healthy food to live a happy life.” She owns four kanals (0.5 acres) of land and earns more than Rs 15, 000 rupees ($220) on a monthly basis. “I was very shy. I would struggle even talking to men. But today I have no apprehensions. I believe in myself,” Begum emphasised. Kashmir is an agrarian economy with more than 70 per cent of the population depending upon agriculture for their livelihood. Even though grassroots female entrepreneurs like Maryam and Begum are not undertaking their businesses at a commercial level, they are breaking barriers and inspiring other women to become self-reliant. Unlike many working women who are finding it difficult to manage their professional and personal life, Maryam and Begum set an example. The trend of women entrepreneurs is substantially increasing in Kashmir, says Dr. Farooq Ahmad Shah, Associate Professor, Department of Management Studies at the Central University of Kashmir: “The uneducated women entrepreneurs, especially in rural areas, still do not have access to technical and financial support that can give a fillip to their businesses from a domestic to a commercial level.” Dr. Shah has extensively worked in the field of entrepreneurship and published many books and research papers in the field. There are cultural and societal norms that hinder equal participation of women in ventures that men undertake. But women have to contribute to entrepreneurial activities in the best way possible, he argued.